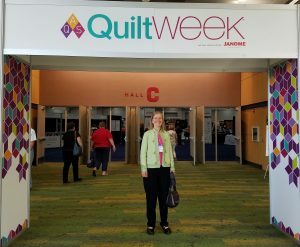 Earlier this month I spent four days teaching at the AQS QuiltWeek in Des Moines, IA. 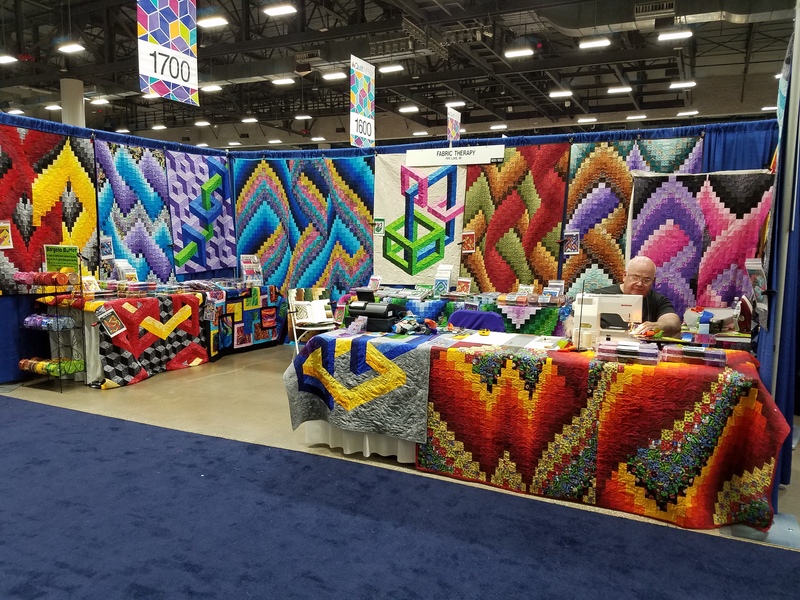 These AQS events have three major components: the quilt exhibits which include a national level quilt show and several special exhibits; the booths selling every imaginable quilting gadget, machines and of course fabric and notions; and a wide offering of classes and lectures. Here I am at the entrance of the exhibit hall in the Iowa Events Center. The other picture shows a particularly colorful booth hosted by Fabric Therapy, a store from Fife Lake, MI. 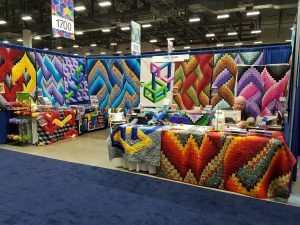 There were around 115 booths, and plenty of quilters busy shopping. 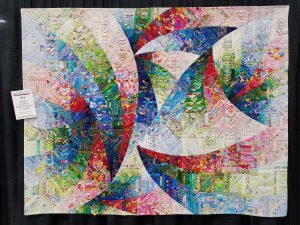 Two of the classes I taught were my Template-free Kaleidoscope Puzzle Quilts and the Template-free Op-Art Kaleidoscope Quilts. Examples of work by my students are shown below. My class sizes were very small, but the students who came were enthusiastic and we had a very enjoyable time. It turned out that the other teachers had low sign-ups for their classes too. The excuse that we were given, was that this summer was very wet which meant that the harvest was late in IA and many quilters were on their farms still harvesting instead of attending the show. I have no way of knowing how much this accounted for the low turn-out, but suspect that other factors are involved. The industry is clearly changing and the AQS, which has been over-extending itself, will only have six national shows next year instead of eight. They are introducing a fall show in Paducah which I hope does not dilute the spring Paducah event that is so special. AQS QuiltWeeks will only have five locations instead of eight (Daytona Beach, Lancaster, Paducah, Grand Rapids and Des Moines, cutting out Chattanooga, Phoenix and Syracuse). It will be interesting to see how it all goes moving forward. 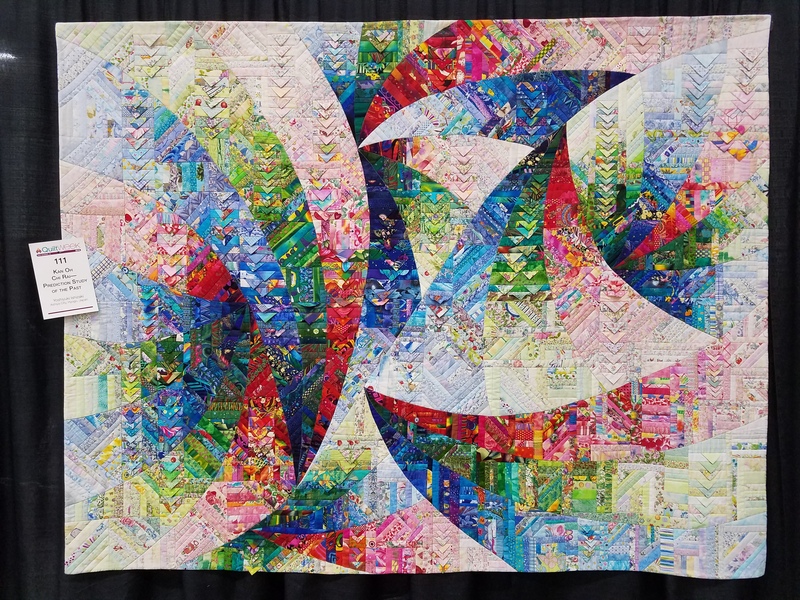 These two quilts were in the AQS judged quilt show. Neither was an award winner but they both appealed to me. They both have a great sense of movement and the use of contrasting values make the designs look stunning. On the left is Kan Oh Chi Rai – Prediction Study of the Past by Yoshiyuki Ishizaki from Ahiya City, Japan. On the right, Pioneer Log Cabin pieced by Diane Bacon of Humbolt, IA, and long-arm quilted by Rhonda Post. 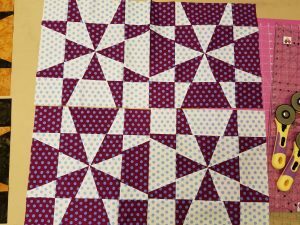 Diane used a pattern from Judy Martin’s book, Extraordinary Log Cabin Quilts. 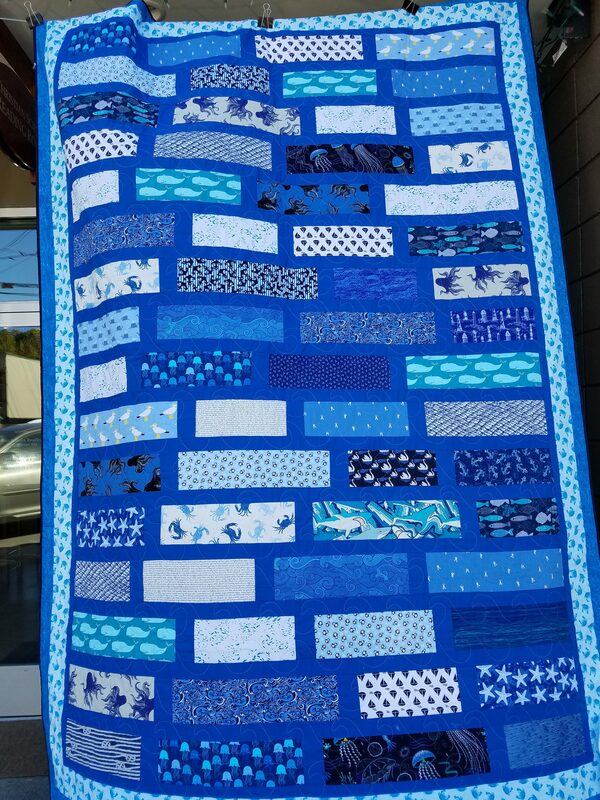 I recently donated this quilt, Octopus’s Garden, that was made at Blakely Elementary School in 1997 to the Bainbridge Island Kids Discovery Museum (KiDiMu). 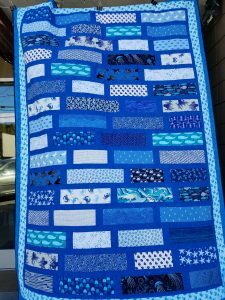 This fish print quilt is featured in my book, Creative Quilting with Kids, now out of print, but still available second hand on Amazon. See the book for more pictures. 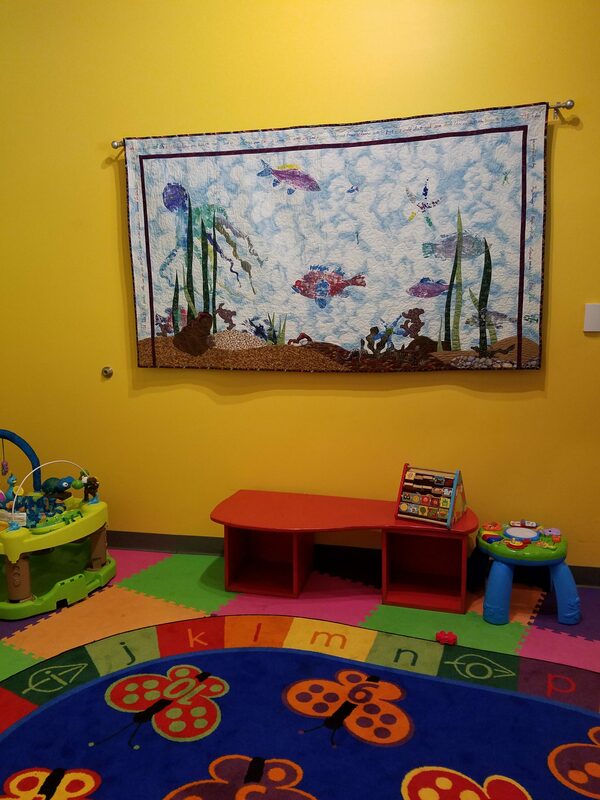 The quilt looks great in the toddler play area of the museum, hung on the yellow wall. I’m delighted that it is now out for people to enjoy, rather than being stored in my closet! I worked in collaboration with the Art Specialist, MJ Linford and the fourth graders. We had a real octopus, rock fish and cabazon donated from the local grocery store. We used rubber fish too, which I have also donated to KiDiMu for their art projects with kids. The fourth graders were eager to paint the critters for printing. The background piece was prepared ahead of time. There are wonderful fabric possibilities to create the rocks and weed. 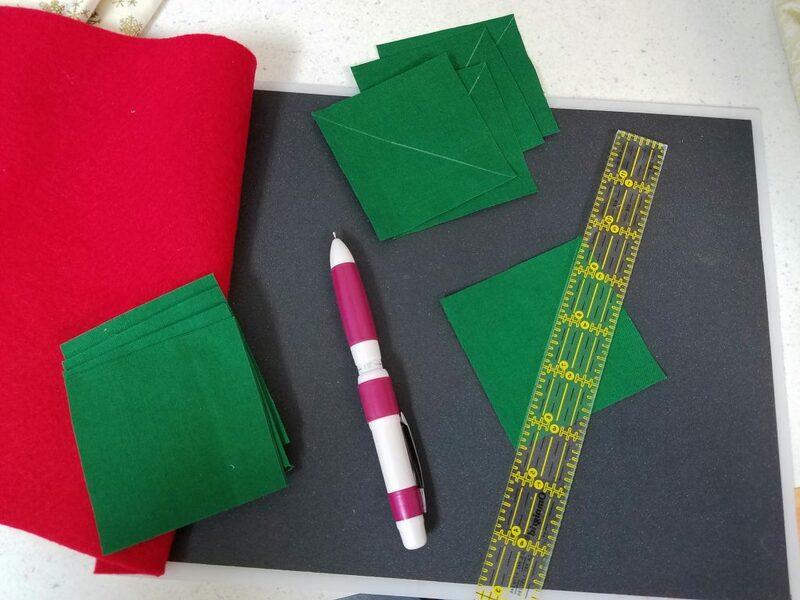 These were applied using Steam-a-Seam2 fusible applique. The painted critters were arranged carefully and the background cloth placed over the top. We pressed the fabric gently using the back sides of spoons and the palms of hands. It was astonishing so see that even the suckers on the octopus’s tentacles were printed and the kids were very excited to see the results. They wrote the words of the Octopus’s Garden song in the border around the quilt. It was a fun project. The kids also brought t-shirts to school to print with fish so that they had a take home memory. 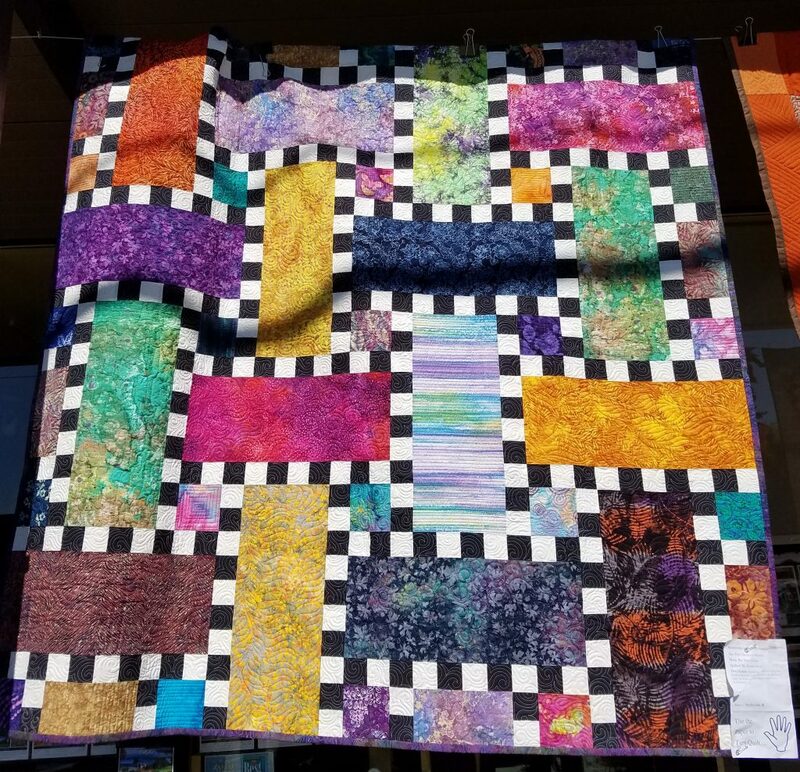 Here on Bainbridge Island, we recently celebrated our 4th Annual Quilt Festival with 190 quilts hanging outdoors for the day, colorfully adorning our main street. 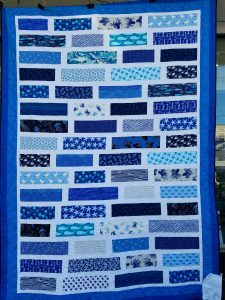 This event is sponsored by the Bainbridge Island Modern Quilt Guild and Esther’s Fabrics. See my previous two blogs for more pictures. These two quilts were hanging next to each other and I was immediately struck by the difference it makes using a light or a dark background. The same fabrics are used in both quilts, but they are highlighted in different ways. My personal preference is for the one on the left with the white sashing. 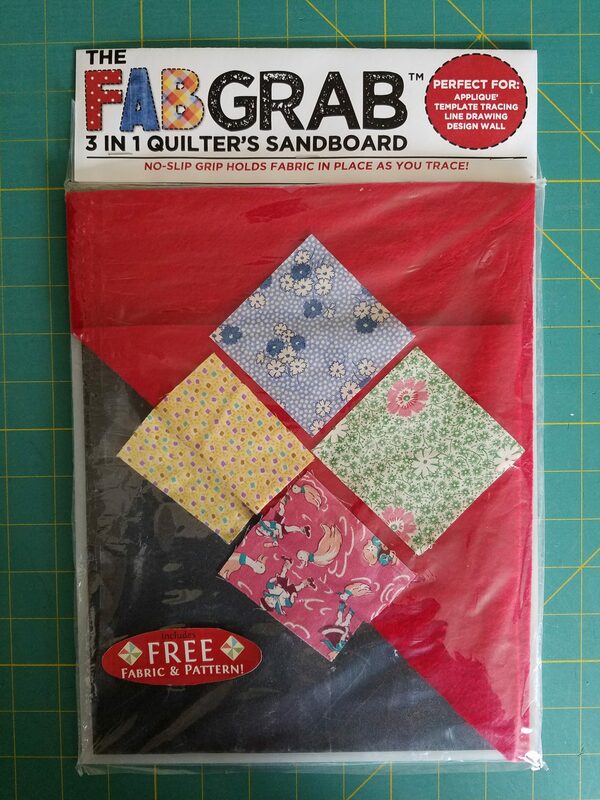 I think that this features the variety of fabrics best. The one with blue sashing is too blue for me. I always advise my students to include either white or black if they are using a monochromatic fabric selection. 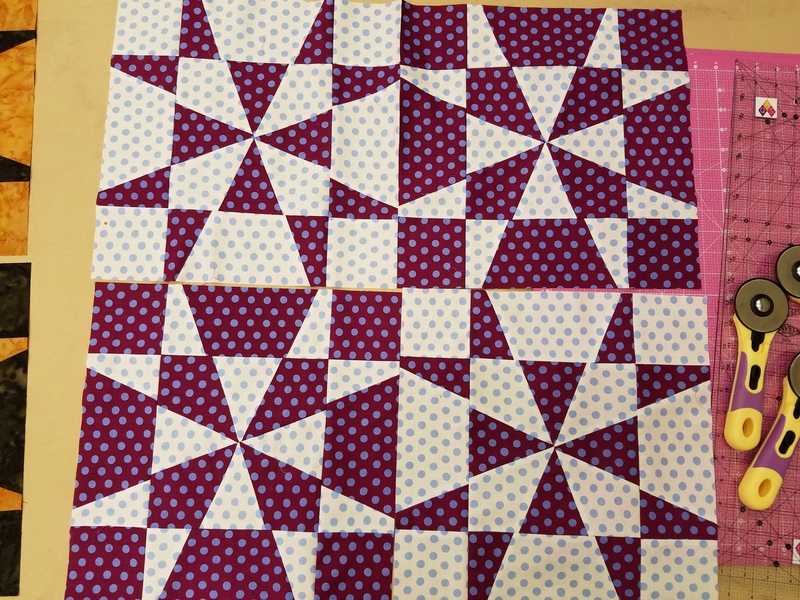 In this case, there is enough white in the fabric rectangles that the quilt is still successful. 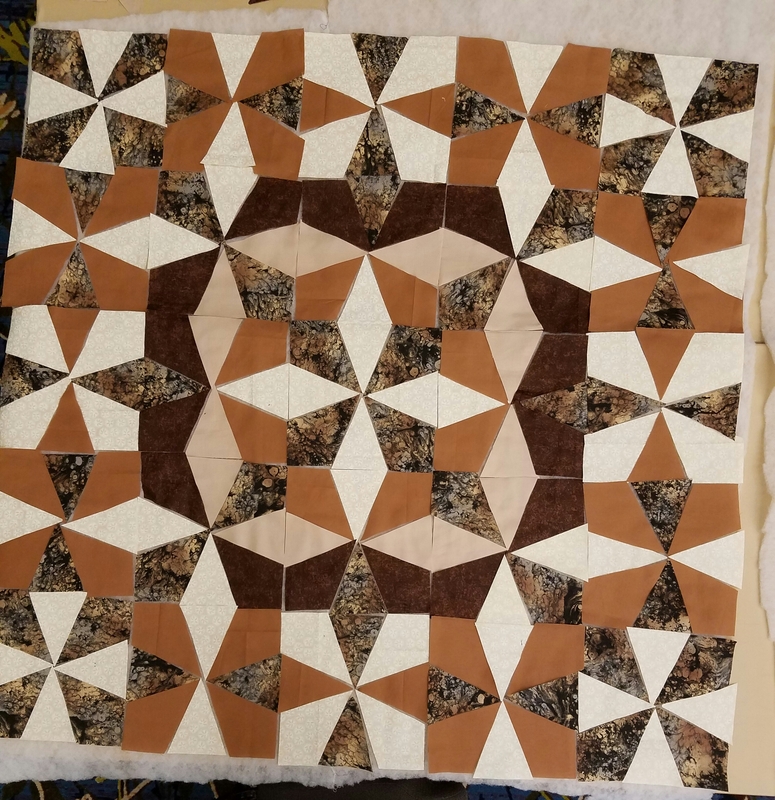 They were both made by Jo King and quilted by Sue Lohse. The one with the white sashing is called Under the Sea, and the other is Deeper Under the Sea. 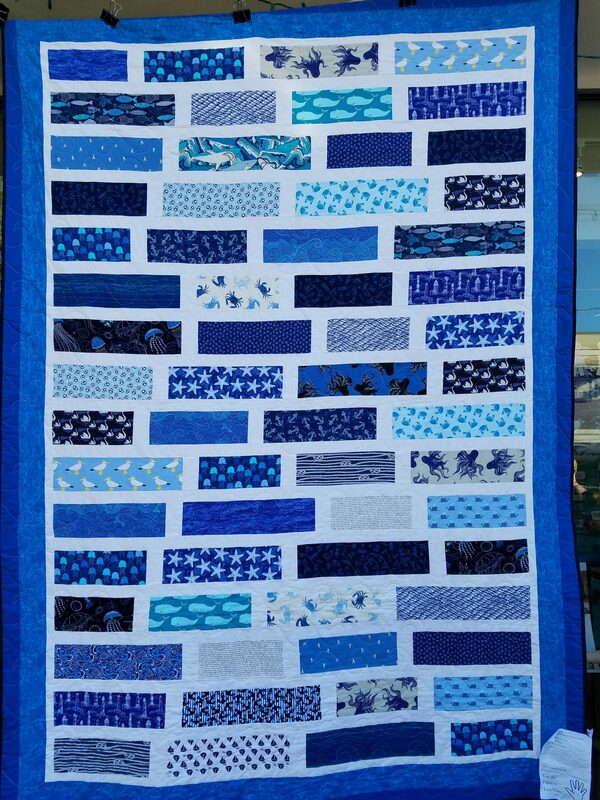 Jo made these quilts for her grandsons and included many underwater, sea life and boating fabrics. 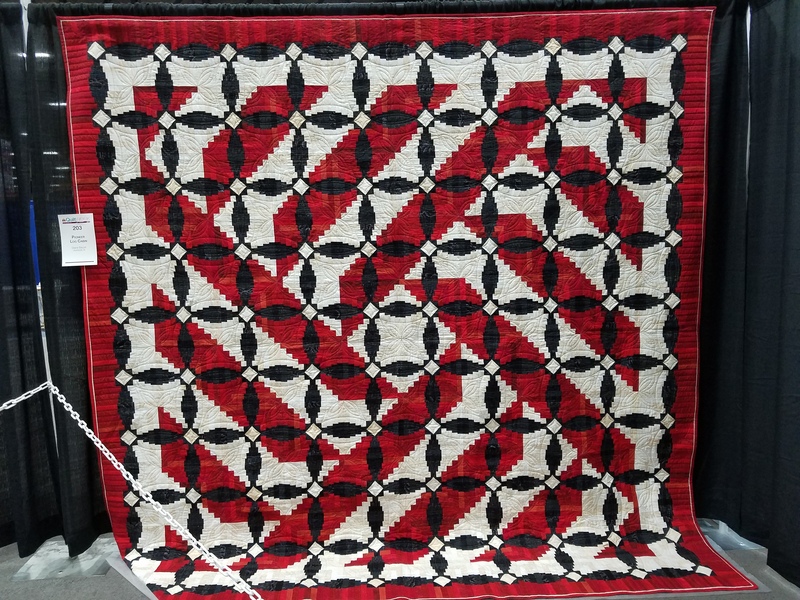 The quilt shown below, with black and white sashing is stunning. 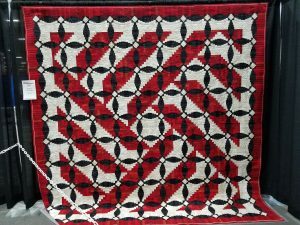 Checkers Anyone, was made by Stan Green and quilted by Krista Moser. The lovely batik fabrics are well presented with the black and white sashing keeping them separated. The colors are intensified. Without this sashing the batiks would merge and the quilt would not be nearly so rich-looking. The checkers form their own interesting pattern too and help to produce the woven effect on the quilt.